There is one lone red tree in the sea of green covering the mountains where I work. I don’t know how it got there. I don’t know why it is different from every other tree in the forest. But it is there, being not-green. Like a thorn, a stem, a speck of something that is not supposed to be there. It shocks me every morning as I look out my window. It is not taller than the other trees, it must have been born at the same time. But it has no siblings; it seemingly has no parents. It is alone, shining in the green. I would walk to this tree, if I could get through the forest, to see what kind of tree it is. With red-brown leaves. I can see all manner of trees adorned with their summer green, yellow and dark forest piney boughs. But still there is that red tree standing, crowded, but distinct. Different. A rebel. Was this lonesome tree the result of a seed carried by a bird, or a fox or a bear? Why was only one seed able to plant and take root in all these hills? Why are there no other red trees as far as the eye can see? Surely it isn’t a dead tree, it seems vibrant, bobbing its leafy head as the mountain winds sweep down to the lake. Even today, as the fog shrouds the hills and peaks the red tree smiles up at the sky. From my perch on the second floor, I feel for the tree finding its happiness surrounded by strangers. I too am a stranger. I too am a transplant from a place far away. I too am finding my happiness while remaining my red-tree self. The other trees crowd and press, murmur and complain. They try to steal the sunlight and water and struggle to tangle the red tree with vines and mar its beauty, cover its spirit. The trees whisper — be like us, think like us, breathe like us, feel like us, look like us, talk like us and be saved. Be comfortable. Be right. The red tree bows under the green crush. Loneliness. 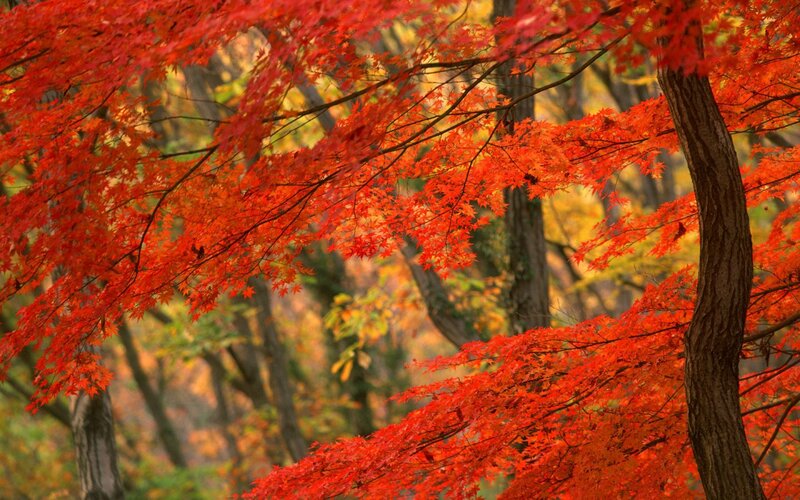 With its red-tree language and red-tree thinking and red-tree feeling its heart beats slowly, deep, between the roots. Bubbling up from the sadness there, the red tree hears: I am who I am. I can be only my red-tree self. Even it if means aloneness. I am the red tree standing. A simple beauty, in my own way. Destined to live and love among strangers, while being my red-tree self. As the red tree straightens and embraces her redness, the murmuring and whispering falls away. A nearby pine brushes its boughs against her slender branches and they hold hands in the summer breeze. Nesting birds sing while chipmunks chase each other across the forest floor, tickling the red-tree’s bare roots. Delighted, the red tree shares all of herself with them, and with me. The forest is at peace.